DJ Jimmy Jatt, Dj Neptune, Dj X-Mix, Sean Tizzle, Orezi And More To Crawl With Hennessy And Beat FM This Friday. This Friday, party lovers residing in lagos can look forward to an extremely exciting relay of club parties as Hennessy Beat Bar Crawl (HBBC) returns for another soul hopping edition. For those not familiar with the bar crawling event organized by Hennessy and The Beat 99.9FM, the concept of HBBC is very simple; partygoers converge at one club, have a great time with the performers and Djs before migrating in-group to the next club and the next one after that, until they all arrive at the last club on the list. This friday's Bar Crawl will start from Bravo Lounge on 32a Admiralty Road Lekki, to Sailors Lounge on Plot 1 Block 12 Admiralty Road and finally reach climax at The Place on Plot 3b Admiralty Way Lekki. 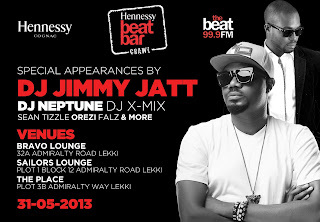 This edition of HBBC will feature special appearances by Dj Jimmy Jatt, Dj Neptune, Dj X-Mix, Sean Tizzle, Orezi, Falz and More. Date: Friday 31, May 2013.